How were the Spaniards able to conquer the vast territories south of central Chile? The indigenous attack of 1541 that destroyed the City of Santiago demonstrated the fierceness with which the indigenous people defended their territories, and many of them moved south to the Maipo and Maule valleys to reorganize themselves. Pedro de Valdivia knew that he would have to weaken the insurgent indigenous groups that had taken refuge in the Aconcagua and Mapocho valleys. He also was aware of other groups living between Angostura de Paine and the Northern bank of the Maule River that the Inca had referred to as purun auca (“barbarian enemy,” later promaucae) for their fierce opposition to the Inca occupation of their lands. The Spaniards described them as lobos monteses (highland wolves), revealing that they, too, feared their resistance and felt contempt for their culture. Clearly, the territorial and cultural definitions that the Spaniards assigned to the territory lying between the Maipo, Cachapoal and Maule Rivers were formulated to margialize the original inhabitants of these lands and satisfy the invaders’ need for geopolitical control over the space. These were fertile lands with abundant livestock and watercourses. The indigenous groups that lived here had a way of life similar to the Mapocho valley groups but focused more on horticulture, gathering wild fruit and roots such as the pique-pique, hunting birds and rodents, and fishing in the region’s lakes and rivers. Their settlements were disperse, with extended families forming separate lineages, each with its own cacique (chief), a title that was inherited on the basis of heredity and prestige. The indigenous settlements of this large territory were grouped into different areas—Angostura-Cachapoal River, Cachapoal River-Angostura de Malloa, the coastal Rapel-Topocalma area, Angostura de Malloa-Tinguiririca River area, and from the Tingiririca River to the southern bank of the Maule River. Cultural differences were observed among groups inhabiting the coast, the valleys and the mountains, as well as those that moved seasonally through these zones. When the Spaniards came to central Chile, the native resistance was oriented to maintaining control of the valleys and lowlands by positioning groups of warriors at strategic, well-fortified points; this war of the forts or pukaras was particularly intense between 1541 and 1544. At this time, local chiefdoms formed federations to fight the Spanish conquest and their people took refuge in the forts with the necessary provisions. The removal of crops and livestock from traditional indigenous lands to fortified positions in the mountains limited the food that was available to the Spaniards in those places. While the Spaniards resisted the war of the pukaras that the chiefs Michimalonko, Tanjalonko, Vitacura and Cateloe waged against them, more indigenous groups moved south into the Maipo Valley, which heightened the threat of a large-scale attack. To prepare for such an event, the colonizers established political alliances with other indigenous chiefs such as Quilicanta, who offered Valdivia four hundred warriors for the fight against Michimalonko. For their part, the Spaniards reorganized some indigenous settlements by handing over lands to certain kinship groups that had been removed from their own lands, and handed out seeds and grains to groups that came to them in peace. It was a dangerous time, and it was crucial for the Spaniards to maintain control around Santiago. They also had to be vigilant near the coast, where nearly six hundred natives had been sent to work in the mines of Marga Marga. 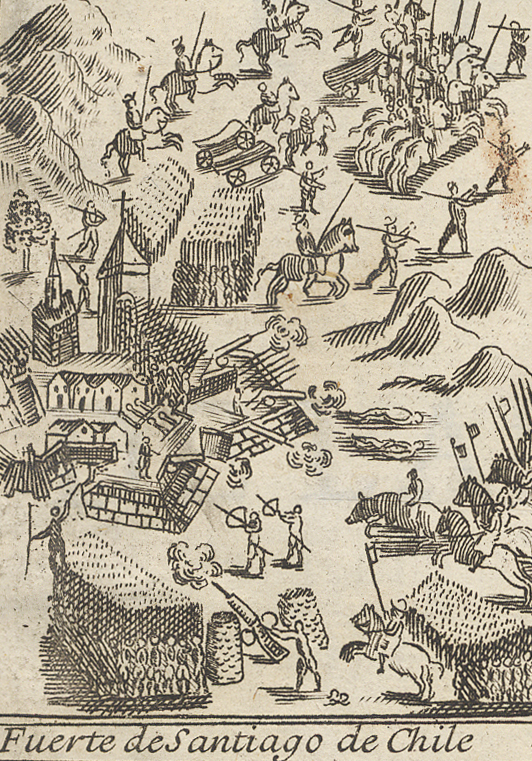 In 1542, the Europeans received news that many indigenous people had gathered in the lands of the promaucae in preparation for a mass uprising. That year was marked by the battle of the Angostura pukara, and the Spaniards’ commemorated their epic victory with a brutal gesture: Valdivia left the bodies of several chiefs and local dignitaries hanging in place as a warning. For Pedro de Valdivia, it was vital to squash resistance in that territory, and he sent several deputations to invite natives who had fled from the Mapocho to the Maipo Valley to call a truce. Meanwhile, more groups continued to move south, effectively hindering the Spanish plan to grant additional encomiendas and assign indigenous workers to them. It became crucial to build a fort to contain the uprisings, and one was erected near the Maule River with the dual intention of holding the frontier and staging expeditions southward to the Biobío River to bring back news of the lands and peoples there, who were led by the chiefs Andalién and Reinoguelen. In 1544, Pedro de Valdivia’s strategy in the region had made it stable enough to enable the conquistador to march south to “populate and sustain” the land. Between 1550 and 1552 he founded Concepción and built the forts of Arauco, Tucapel and Purén and the cities of Los Confines, Valdivia and Villarrica. In 1553, however, he was taken prisoner in the Battle of Tucapel and died while in the custody of chiefs Caupolicán and Lautaro. Colonists fled from the southern cities, and in 1555 the natives rose up in the province of the promaucae, chief Caupolicán was victorious in the Araucanía region and the cities of Concepción, La Imperial, Villarrica and Valdivia were besieged. These events also threatened the placer mines operating at Quilacolla, Valdivia and Villarrica. At that time, Lautaro and his people crossed the Bío Bío, ready to liberate the lands further north and conquer all of central Chile. When his force crossed the Maule River a new campaign in the war of the pukaras began. He rallied his forces at the fort of Peteroa, near the Claro River, and the Spaniards sent Pedro de Villagrán to destroy it. Lautaro fled to the mountains, taking refuge in Mataquito. That year, 1557, Spanish Governor Francisco de Villagra was in the midst of putting down a rebellion in La Imperial and Villarica; when he received news of Lautaro’s whereabouts, he went to Mataquito and assaulted the fort, causing Lautaro’s death in the process. The death toll among both promaucae and Spaniards was high, and the native defeat marked the end of the indigenous alliance established by the toqui (war chief) Lautaro, the indigenous man who had once been Pedro de Valdivia’s personal servant. Over the same period, indigenous groups also carried out attacks against the colonizers south of the Itata River in the provinces of Arauco, Tucapel and Purén. The situation was alarming, with hunger, crop burning, plagues and drought wreaking serious damage. Meanwhile, the Spaniards continued their conquest, reestablishing enclaves, forts and cities in the midst of war. In 1558, the toqui Caupolicán was captured and condemned to death by impalement. Forty years later, a second indigenous uprising occurred that culminated in the battle of Curalaba, in which Governor Martín García Óñez de Loyola met his death at the hands of toqui Pelantaro. As a result of this conflict, the southern frontier of Spanish control was set at the Bío Bío River; beyond that, Arauco continued to present a great challenge. The so-called Arauco War, immortalized in Alonso de Ercilla’s epic account, demonstrated the precariousness of Spanish control in the region, while the establishment of this southern frontier ushered in a new stage of intense armed conflict, diplomacy, trade and mestizaje, which together forged a complex web of interethnic trans-border relations. It is worth considering the degree to which the results of the Spanish presence—the successive wars, the hunger, typhus, the population’s forced displacement into encomiendas, to the mines and for other works, among many other measures—caused the collapse of the indigenous societies of central Chile. And is it right to speak of ‘pacification’ when these conflicts actually were expressions of the native inhabitants defending their land and families against the many effects of the invasion?